As the Russians plow their way deeper into the jungle, the local wildlife gets stranger and stranger, influenced by the ancient energies flowing from the lost city of Akator. Alerted by panicked shouts from elsewhere in the column, Dovchenko turns to find himself surrounded by giant fire ants. He must fight his way free, or be painfully consumed by the immense insects. 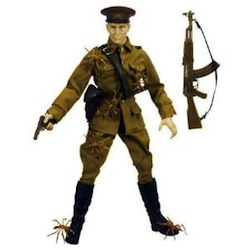 Embark on your own thrilling Indiana Jones adventures with this Russian officer action figure. This comes with Dovchenko's enemies on guard with a pistol that fits in the figure's hand, and a holster on the officer's belt that keeps the pistol at his fingertips. Pose the weapon in his hands to stage him in a showdown against the giant fire ants. This action figure comes dressed in uniform with hat, pair of boots, belt with holster, pistol and 6 giant fire ants accessories.